Continued growth of aquaculture and the change from small-scale to high intensity, industrial farming has increased the need for sustainable protein sources in both shrimp and fish feeds. QRILL Aqua, from Antarctic Krill, is used in fish and shrimp feed around the world. It functions as a sustainable attractant and growth accelerator. Read about the aquaculture market and the potential of krill meal as a feed ingredient below. Krill is one of the most abundant species on earth with a biomass of around 500 million tons. The Commission for the Conservation of Antarctic Marine Living Resources (CCAMLR) restricts harvesting to a specific region in the Southern Ocean, Area 48, and to an annual krill harvest of 1% of the total biomass (the precautionary level for other fisheries is 10% of the total biomass). Aker BioMarine’s krill fishery has been certified by the Marine Stewardship Council (MSC) as being sustainable and 100% traceable. Continued growth of aquaculture and the change from small-scale to high intensity, industrial farming has increased the need for sustainable protein sources in both shrimp and fish feeds. However, fish meal supplies from wild-caught fish have stagnated. A way to address the high demand and fish meal shortage is to replace fish meal with soybean meal, which increases cost effectiveness and sustainability of commercial feed. However, soybean meal has a different organoleptic profile than fish meal. 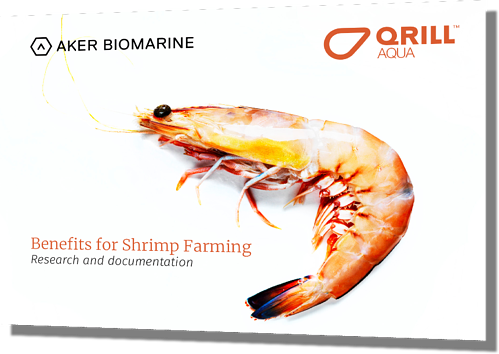 Reduced palatability, as well as anti-nutritional factors causing low digestibility, can lead to impaired growth performance of shrimp and fish. Moreover, fish meal is of significant dietary value as a source of nutrients, including minerals and omega-3 long-chain fatty acids that are absent in soybean meal. In contrast to marine lecithins that contains omega-3 fatty acids in phospholipid form, soy lecithins are particularly rich in the pro-inflammatory omega-6 fatty acid, linoleic acid. A sustainable source of omega-3 phospholipids and proteins is krill meal, a feed attractant, which is intended to partially replace fish meal and overcome low palatability of e.g. soybean meals. Due to its inherent advantages – i.e., feeding stimulants, omega-3 fatty acids bound to phospholipids, highly digestible peptides, naturally pure and stable, sourced sustainably – krill meal inclusion into shrimp and fish feed improves growth and yield. In particular, in diets low in fish meal, krill meal’s feed attractants increase palatability and improves growth performance. It is prepared from an aqueous extract of Antarctic krill (Euphausia superba), which is harvested in the Southern Ocean on board factory vessels. The cooked, dried and ground whole Antarctic krill gives a powder of brownish-orange color. You can see all QRILL Aqua products here. -The antioxidant astaxanthin provides pigmentation and is known to have anti-inflammatory properties by the ability to scavenge free radicals, thereby counteracting oxidative stress and damage to proteins, lipids and DNA. Feeding stimulation by partial replacement of fish meal by krill meal in diets leads to increased growth of shrimp and fish. This is also seen to be true in situations of feeding depression (e.g. high vegetable diets) or stress conditions (e.g. change in salinity or temperature for shrimp and seawater transfer for salmon). Moreover, krill meal is used in functional feeds for fish to increase growth and fillet quality. Interestingly, reduced mortality and heart pathology during viral infection is seen in studies with salmon fed krill meal. Want more information? Don't hesitate to get in touch with us.